The Central Union of Agricultural Co-operatives, or JA-ZENCHU, announced on November 24, 2013, the final competition of its National High School Students "Minna DE Egao" (all smile together) Project won by the Local Biological Research Club of Chiba Prefectural Narita Seiryo High School with an eco-friendly agricultural initiative using insects. The project sponsored an agriculture-themed competition in which high school students across Japan were invited to come up with an idea to bring a smile to the local community, put it into an action and give a presentation on the process and results. Among 160 participating teams from 115 high schools, six winning teams shortlisted for the National Final delivered presentations on their activities to revitalize farmers. Participating teams were evaluated in terms of their ideas at regional competitions, and achievements and contributions to local communities. The national competition winner, Chiba Prefectural Seiryo High School, explored biological pesticides using natural predatory insects to reduce the use of chemical pesticides for sustainable and eco-friendly agriculture. 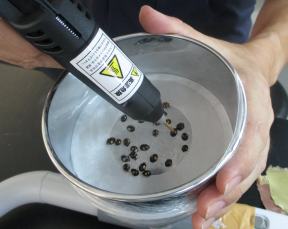 The club members used local ladybird species, not alien species from other countries or other parts of Japan, as an anti-aphid biological pesticide. They succeeded in expelling aphids without using chemical pesticides by using ladybirds temporarily rendered unable to fly. This was accomplished by applying hot-melt, low-viscosity adhesive to the ladybirds' wings, thus anchoring them to the farm. The club members also simplified this treatment for rapid application to a large population of ladybirds without harming the insects by altering the aspiration nozzle of a vacuum cleaner, and attaching it to a funnel having a fine-mesh net, thereby allowing ladybirds to be immobilized by suction.